The fresh organic green beans have been looking so good at the store lately I can’t resist picking up a carton. When I get home I figure out what I will do with them. Last time it was Chinese buffet style but this time it’s succotash. Love the word, never really knew what it was. Now I do and I love it. Super simple and tasty, it just feels healthy to eat it. When the edamame beans and corn mix in your mouth it has a wonderful buttery taste. I altered the ingredient ratio because I only had so many edamame beans to work with so I had to make up for them with extra green beans. I think this is one of those recipes you can just eyeball after you’ve made it once. You could even simplify it down to one cup of each vegetable, two tablespoons of olive oil, salt and pepper and there you have it. Succotash, you can learn more here if you’re a major dork. 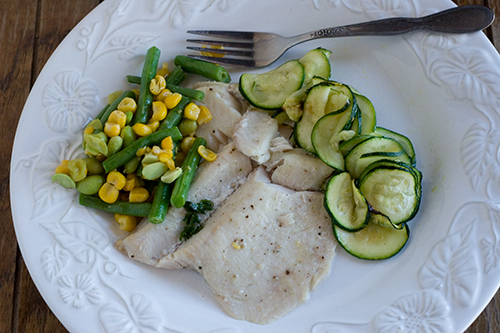 We served this succotash on the side of some broiled rainbow trout with some thinly sliced roasted zucchini for the other side. A lot of great quality veggies here. J and Z actually love/freak out for these roasted zucchinis. I would have never imagined it, but I’m loving it. I got this recipe from an awesome book I’ve been reading and think everyone should check out. It’s called Simple Food for Busy Families: The Whole Life Nutrition Approach By Jeannette Bessinger, Tracee Yablon-Brenner. I won’t go into how great it is now but let’s just say it’s crazy informative. We halved this recipe and had enough for two adult sized portions and one kid sized. Head oil in a large skillet over medium heat. Cook for a few minutes to mix and thaw. Cover and cook on low until veggies are hot but not mushy. Add paprika, salt and pepper. This entry was posted in American, low calorie, vegetarian, Whole foods and tagged low calorie, succotash, vegetarian, whole food. Bookmark the permalink. Both comments and trackbacks are currently closed. 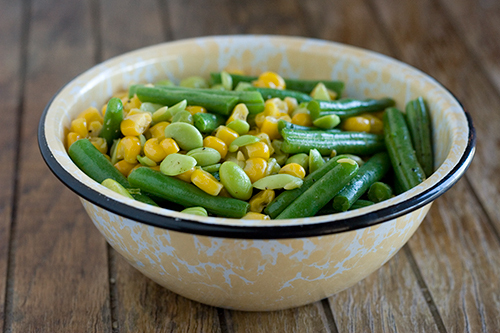 I’ve shied away from succotash in the past… but that bowl of beans looks so good, I want to dive right in! You’ve convinced me it’s worth a try. There’s been a lot of roasted zucchini on our table lately too. Margie – Yeah, it’s not typically a kid favorite or even adult for that matter. It even comes across a little old school but it’s super good for you and all natural. The edamame beans help a lot. It’s the lima beans that give this dish such a bad rap and replacing them worked great in my opinion. Try it, after reading your “about” page I think you will enjoy it as it is “real food”.